A Pink Sapphire Diamond Ring, A Flower Motif Ring Available In Gold And 925 Silver. Jewelry with flower motifs never fails to deliver a refreshing and lively appeal, this is all the more true when the jewel is adorned with pleasing colors like pink and white. The RG224PS pink sapphire and diamond ring, is crafted by highly skilled artisans, our gem experts carefully inspect and pick every diamond or gemstone that is set in the ring. Sapphires have been known for many centuries but, they were always associated with blue - those were the times when sapphires in colors other than blue were unknown. With science and advanced testing techniques today, revealing the dazzling array of colors in which sapphires are found, the fashion frontiers of this gem have ventured far beyond blue. Pink symbolizes love and caring and when it does show up in a rare gem like sapphire, it is something that most ladies would love to wear. So whether, you plan to pamper yourself with a sapphire ring or, gift it to that very special person in your life, get to know more about this gorgeous pink sapphire gold or silver ring. We maintain the same quality levels for the silver or gold sapphire ring, true jewelry lovers will appreciate the fine workmanship and handpicked gems that are provided for each ring. When ordering a gold pink sapphire ring, choose from 14k or 18k gold, request for a specific quote if you prefer to have a 10k gold ring. There is no reason to seek color to merely gems and diamonds, we allow you to choose from all three gold colors namely, white, pink and yellow. The past 4 to 5 years have seen mature and seasoned jewelry buyers demanding silver jewelry that, is designed and crafted on the same level as gold and platinum jewels. Besides being more economically priced than gold, sterling silver also has a timeless aura to it. The pink sapphire silver ring will please even the experienced jewelry buyer, few jewelers put in as much effort and sincerity as we do in making both silver and gold jewelry. We do offer white rhodium, yellow gold or rose gold as plating options for the pink sapphire sterling silver ring but, would like to make an important comment related to plating on silver. Most buyers expect to get that high priced metal look by plating their 925 silver jewelry, but the fact is that any plating done on silver will come off after some wear and tear. If you have read and understood this and still, prefer to have your silver pink sapphire and diamond ring plated, let us know at the time of ordering. Each pink sapphire diamond ring is fully custom made in sterling silver or gold. The gold sapphire ring is available in 14k or 18k gold, you can pick white, yellow or pink gold. Request for a price quote if you need a 10k gold ring, available in all three gold colors. You can choose the gemstones of your choice, gems can be mixed in the same ring. An interesting option would be to pick more than one sapphire color for your ring. The gems are 5x3mm, the center diamond is 2mm and the other diamonds are 1.5mm. We maintain the same quality standards for the gold and silver sapphire diamond ring. Requests for all ring sizes can be accommodated for both, silver and gold sapphire rings. The gold ring has a weight of 10-12 grams, the silver ring would have a similar weight. The sapphire and diamond ring has a uniform band width of 3mm all around the band. While we do provide plating options for the silver sapphire ring, no plating lasts permanently. You can request for a white rhodium, yellow gold or rose gold plating for the silver ring. 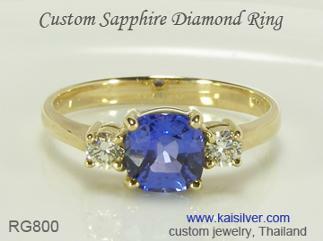 Customization: Since every jewel at Kaisilver is fully custom made, we place no restrictions on your sapphire diamond ring. You could pick the RG224PS design concept as it is or, request for modifications based on your preference. We will gladly custom make your ring with a design image or sketch provided by you. 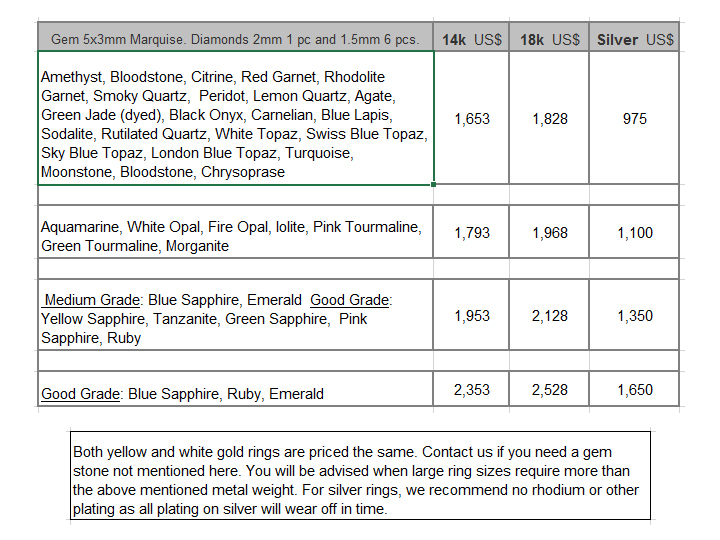 The price table provides a wide array of gems for you to choose from but, this list does not limit your selection. We can craft this ring or any other jewel for you, with the gemstones that prefer. You could generate a more colorful effect for this ring by combining various gems in a single ring. And if you wish to stay with sapphires but want a colorful look, you can combine various sapphire colors like white, pink, green, orange, yellow and blue. How To Buy: We recommend that you first discuss your requirements with our support team at sales@kaisilver.com Make sure that you get clear answers to all your questions, feel free to ask as many details as you wish, make a purchase decision only after you are fully satisfied. Our support experts are evaluated based on the quality of solutions and advice that they provide, you will therefore never feel obliged to make a purchase from us. Since all our jewelry is fully custom made from start to finish and relies heavily on the skills and talents of artisans, there is a production lead time of 4 to 6 weeks from the date of order confirmation and receipt of payment. We accept payment through Paypal and Western Union but, do not recommend Western Union for first time buyers. Discuss your preferred mode of payment with our support team, they will provide you details for the same. We will ship through FEDEX and you will receive the tracking number the moment the parcel ships. Kaisilver: We continue to maintain our position as the leading online provider for high end custom made jewelry in gold and 925 sterling silver. We craft jewelry in gold and 925 silver with the design and gems of your choice. Our seasoned gem stone buyers can procure any gem available on earth for you, most gem mining centers give us top preference in selecting exclusive and rare gems mined by them. We also have direct access to over 200 million carats of cut and polished gems. More than 7,000 quality conscious gem and jewelry lovers spread across 5 continents, prefer to order their merchandise from Kai Silver. Get in touch with our expert team at sales@kaisilver.com and let us help you get the best value for the money that you spend. Testimonials: Hello, I received the ring today! Thank you very much for the fast delivery.It is one of the nicest rings I have ever seen, and the blue lapis goes with the yellow gold very nicely. The build quality of the ring is excellent, I can't say enough for it. It is a very solid sturdy ring, and I like the nice thick underside of the ring; it is even thicker than that of some large school class rings I have. Please convey to the craftsmen who built the ring, and to everyone I corresponded with; I enjoyed very much conveying the design to you, and I hope the craftsmen enjoyed making it as well. I will keep up with your website and ring designs, and when the mood strikes, will likely have you craft another ring for me. Sincerely ... Albaugh .... more. 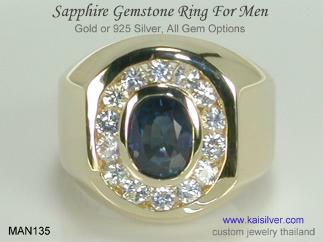 A handsome men's sapphire and diamond ring, available in 14k and 18k gold and also as a fine silver men's gemstone ring. You can order your men's sapphire gemstone ring with the design of your choice and pick, white, yellow, green, orange, blue or purple sapphire ... more. A gorgeous sapphire diamond ring available in gold or 925 silver. Wear it to satisfy your desire for a fine sapphire ring, reserve it for that special event and flaunt it as a wedding or engagement ring. This gorgeous jewel will always win admiration and make you proud ... more.